LIL (Little Interpreted Language) is a small highly dynamic scripting language inspired by Tcl and unix shells. The language has two implementations: one in C which consists of a pair of c and h files and one in Free Pascal which consists of a single pas file (a unit). Also a Lazarus package for the latter is provided. The library is written by Kostas "Bad Sector" Michalopoulos and licensed under the zlib license. From this site you can download an archive containing the latest version of both the C and Free Pascal implementations, some examples and documentation. Makes C LIL's rename to delete a function if it is renamed to nothing. 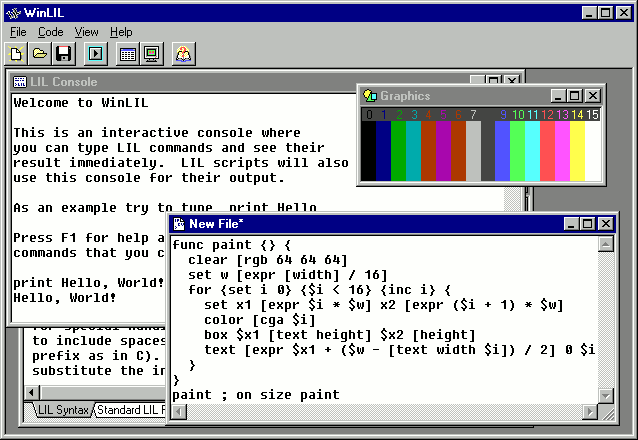 If you have Windows, you can also download WinLIL 1.1 (196KB) a small Windows based environment with editor, console and extra graphics functions that can be used to experiment with LIL (screenshot). It is self-contained in a single executable, including the LIL documentation. Version 1.1 (20170425) fixes a couple of bugs from the previous version 1.0, like autoalignment in the editor, size event firing for the canvas and (not) displaying event code value. You can also get the source code (34KB), although keep in mind that the program was made using an ancient version (the first one actually) of Borland C++ Builder. For an example of WinLIL code (which also doubles as how LIL looks) check this doodle program (screenshot).